It was a something of a curiosity, because he’d not seen the movie. Yep… he really liked that song. So I decided to buy the whole movie for him. It felt like an obvious next step. has become the top-grossing animated film in box office history. (All that said, I was still a little concerned about “Frozen’s” PG rating. Though I figured… hey, it’s Disney. He hadn’t seen it when it came out in the theaters last year, because he wasn’t quite old enough yet to hit the movie multiplex. I still like buying Blu-ray Discs that also provide a digital download option from iTunes. That gives me lots of flexibility in choosing how I (we) watch the flick, and I’m willing to pay a little more for the packaged deal. The problem is the movie studios are making it increasingly difficult to ‘own’ your digital copy and house the file within the confines of your physical kingdom. So they’ve developed their own cloud-based streaming services like UltraViolet. I didn’t want to open up a whole new complicated relationship with UltraViolet. But when shopping for “Frozen” on Amazon, I noticed deep in the small print a vague ‘mention’ of iTunes as a download option. I scoured the photo of the Blu-ray Disc box and saw no mention of UltraViolet. So I figured Disney hadn’t gone completely over to the Dark Side, even though they now totally own it. I bought the “Frozen Collector’s Edition” on Amazon for 25 bucks. The file would also come in handy for pre-screening in bits and pieces while on the go. 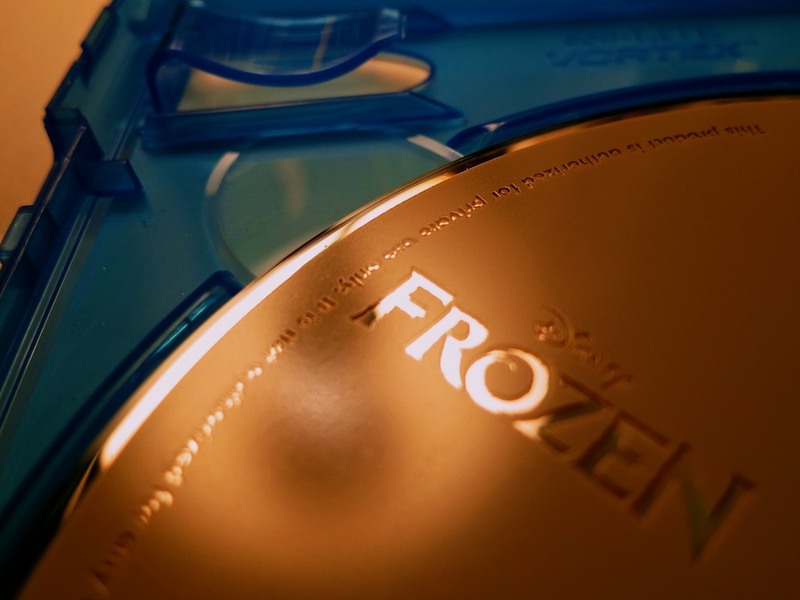 “Frozen” arrived in its non-descript Amazon brown box, and I eagerly slit it open, ready to extract the magic of Disney from the corporeal disc into my iTunes library. Next, I snapped open the plastic case…. Inside, I saw an insert promoting the wonders of DisneyMovieRewards.com and how to get the original motion picture soundtrack for only $7 with the attached Magic Code. There was no code for the digital download! How did that little detail get missed?! For me, that’s as bad as forgetting to put the disc in the case! You’re supposed to go to Disney’s Digital Copy Plus site to redeem your code. So I figured there must be a help section somewhere. And indeed I found an email address to send along my complaint and a specific page documenting what I needed to provide to receive a replacement code. And believe me…It was no small task finding all the requested numbers tattooed all over the box and disc. The next day I received what seemed to be an automated response. But buried deep in Disney’s message were eleven random alphanumeric characters. I took the warning to heart. So I copied and pasted the code into the yellow box and waited. I watched the next URL seemingly struggle to load. It was as if I had activated some massive back-end protection protocol to ensure I was not scamming Disney. I thought I sensed a black ops chopper hovering overhead and a thermal scan permeating the room. But I had the code. Disney gave me the code!! This should be straightforward, right? I was then directed to iTunes and “Frozen” began to download. Order was restored in the Lester household. And it was finally time to watch the movie! I will say as annoyed I was with having to go through this unnecessary dance, Disney was pretty quick to resolve the problem. Just wanted to say thanks for this post. I was so rattled when there wasn’t a code in the box, but I followed your steps and they got back to me quite quickly, had me take a pic of the DVD and a number written on paper, and got the code!